Hello Friends! As we all know, we got a wonderful patch this past week with all sorts of sweet features, including shiny Sigils, balance changes, and new Avatars. I discuss all of that in a lot of detail with SirRhino on my podcast this week, so check that out if you want to hear my thoughts on that (found here). 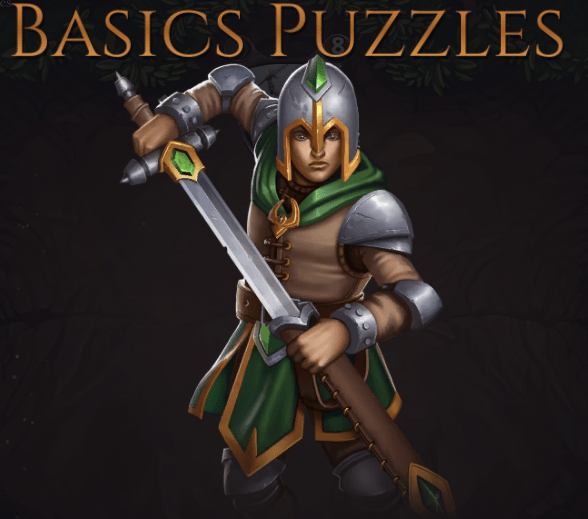 Today, though, I am going to be talking all about puzzles! Did you get stuck? Don’t understand one of the interactions? Not into fiddly puzzles, and just want sweet loot? Well, here are the solutions! Before getting into that, I will encourage everyone to try these out before using the solutions. They are a lot of fun, and are a great teaching tool. I will also warn that this is just 100% spoilers, so if you are someone who doesn’t want that, you have been warned. Anyway, here you go! Your Fledgling is a 0/3 since you have no other flyer, but luckily you have an Elder’s Feather available. Violent gust down the 1/5, use the feather on the Stranger, and GG. Your opponent is at 8, and you conveniently have an 8/8 available. Clear out the blocker with Xenan Initiation on your 5/1 and then attack for the win. Though Finest Hour is usually used on your own units, it can also be used to remove aegis from your opponent’s units! Finest Hour the blocker, use Permafrost, then A + space. Ijin’s ability gives +4/+4, so you can turn your 4/4 charge into an 8/8. Play the Hound, activate the ability, and slam for lethal. You need to deal 12 damage across your 3 units, and you only have access to a seal, and some Strangers to boost your damage. If you are able to get to FFFTJPS influence you can deal 4 damage with Champion of Chaos, 5 with the Stranger, and 3 with the Champion of Fury. Play Seal for Justice, then Praxis and Skycrag Stranger and you will get the damage you need. Here you need to survive the enemy turn, as opposed to win this turn….though you actually just need to win this turn, since your opponent has a big tasty Flame Blast ready for you. Polymorph the 3/4, then kill it with Piercing Shot (dealing 2 to the AI), and then attack for lethal. As most probably know, Overwhelm + Deadly means only 1 damage is dealt to a blocker, and the rest gets dealt to the player. If you A+space the opponent will block the 2/3 on the 5/3, so you can Viper’s Bite the 5/3 to deal 4, in addition to the 1 from the 1/2. 4 + 1 = 5 = game. We come into this game in a seemingly impossible situation. We are at 1, out opponent has 2 units in play to our 1, and they are even attacking out Instigator with a Sword of Icaria! This is easily handled though. Shoot down the Sword with a Torch, then block the 3/4 followed by casting Ruin on the Obelisk. Now your opponent should be a 3 with no blockers on your turn. Your first instinct in this kind of board state is clearing out the blocker to attack for lethal, but this isn’t Twitch chat, so you actually need to do math. If you Twinbarrel the Ticking Grenadin and attack with your units you will deal 2 with the Grenadin and trade the 3/3 with the 3/2. You can now Annihilate your own Grenadin to deal 6 damage from the Entomb effect. Shield Bash stuns an enemy unit, and gives you just enough armor to survive an attack with your Javlin, clearing the way for your 2/1 to finish the job. It doesn’t matter which unit you hit with the Shield Bash or attack, you just need to make sure the way is totally clear for your 2/1, and that you don’t attack with Javlin before using Shield Bash. As we come in you there are 4 Lethrai Rangers on the other side. Seems pretty grim, but Karmic Guardian is our ally! Play her, and buff her with Sparring Partner. Since she has endurance you can block with both Guardian and Sparring Partner. Now you can attack with Guardian and finish off your opponent with Alchemical Blast. Once again we come into a game where we are under attack, but out opponent is at 1, so they are clearly pretty vulnerable. Obviously you want to play both your units. You need to silence the Beastcaller because the infiltrate ability will give the computer 5/5 blockers. In order to win next turn your need to keep the 2/1 alive, so it cannot block. The 0/6 then needs to block the 4/3, leaving you at 2, and your opponent at 2 (after the lifesteal). Now the 2/1 should have a clear path to finish off the game. Fairly simple puzzle. If you silence the 1/5 you will be able to Daze it, and if you silence the 1/1 the Owl will be free to attack. It doesn’t matter what silence effect you use on which unit. As a general rule in these puzzles you should count on your deck for absolutely no help. There is no Static Shock or Xenan Obelisk hanging out on top of your deck. To win we must gain life 4 times to get our 1/1 to be a 5/5. Obviously the Camel is important, since this is our only route to gain health. Play that, then play Find the Way to get trigger #1. Now play Excavate on Find the Way for trigger 2, then use your Storyteller for trigger 3+4. Now you have a 5/5! Our Vorlunk is our path to victory here, in combination with the Crownwatch Cavalry in hand. Play Cavalry buffing the Vorlunk, then play Unlock Potential to buff your team including the Cavalry. You can now Teleport Cavalry back to your hand and play it again, once again buffing the Vorlunk. You can now A+Space to deal exact damage. This is a much easier puzzle than it initially looks. The important part is knowing Stormcaller + Deadly kills anything. Set that up to kill the 6/6 lifesteal. You can now dump the rest of your hand (with the exception of the Savage Stranger), attack with everything and Torch face for lethal. You may be tempted to Lightning Strike the Vorlunk, but this doesn’t set you up to win next turn since the Titan is going to block your flyers. Play the Wasp to block the Sandstorm Titan, and the block the 3/4 with the 0/2 and the Temple Scribe. Now your Humbug is free to attack, and with the +1/+1 from Synchronized Strike you win! Humbug Lethal! If you attack with everything the 8/4 will block one of your units. You can now cast Trigger Happy + Viper’s Bite to kill the 8/4 before it does lifesteal damage, leading to a clean kill! The Last Word turns all your damage effects into kill spells. Play the weapon to kill one of the 5/5s, then use Vara’s Favor to kill a second, and finally Temper to eliminate a third. You know have 4 attackers to 1 blocker, so an alpha strike will win the game. If Alpine Tracker is deadly then all his ping effects will be lethal to your opponent’s units. Play him out, cast Viper’s Bite on him, Teleport him back to hand, then replay him to clear the way. You have conveniently dealt 2 damage from Tracker’s summon, so you can finish off the game by attacking for the last 3 points of damage. This is a supremely unusual board state, but you just need to eliminate a blocker to win the game. Play the Venomspine Dagger + Predatory Instinct on the Talir’s Favored, then attack one of your opponent’s units. This leaves them at 6 after the Instigator damage, then attack with your other units to deal the last 6. It actually doesn’t matter which unit you attack with the Talir’s Favored, but if you like living on the edge, kill the 6/5 so you can win the game while the lethal Instigator trigger is waiting to kill you! Killer + quickdraw means that you get to deal your killer damage before your opponent’s unit. Play the Skycrag Wyvarch then Trigger Happy to attack down the Instigator. You can now use the exhausted Wyvarch + Combust to kill the Sanguar. Play the Ember then attack with everything for exact lethal. When you use a killer attack with a warcry unit you get the warcry bonus. What this means is that you can play the Flagbearer, and use Xenan initiation to kill the Wasp. Now the Alluring Ember on top of your deck will be a 3/3, which you can play and attack for lethal. Humbug + Talon Dive + Xenan Initiation attacking the Wasp will both clear a flying blocker and enable Spark. Now play the Skyrider Vanguard and attack with your flyers to solve the puzzle. Play the 2/2 then cast Xenan Initiation and kill one of the deadly units. Next, use Carnasaur’s killer attack to eliminate the 5/5. Attack with the Terrazon and the Viper. The AI will block the 8/8 with their remaining deadly unit and take 1 damage going to 7. You can now cast Bad News, attack with your team, and the 7/7 blocking your 8/8 is still not enough to save your opponent from taking 7. You come in with a great board state, but not a great life total. If you attack with everything your opponent will Lightning Strike the Shelterwing Rider, meaning that they take 15, going to 21. You must Safe Return the Rider back to hand and replay it to refresh its aegis. You pass the turn (going to 1), the AI does nothing, and then you attack for the 21 before you die to your Dooms! This is a puzzle where you have 2 turns to win, which is an important difference. There is a loaded board, and there are a lot of ways you die from this position, so you need to clear the board with Leave a Witness. Before casting it you should attack with Bartholo (and nothing else because the 6/6 lifesteal on defense will screw up your combat math). Now cast Leave a Witness using Icaria as the student. On your next turn you should play the charge unit, attack for 7 and then finish the puzzle with a 3/3 Jawbone Hatchet. We have 3 copies of Protect along with a whole team of dudes, but the Spirit of Resistance is looking to make our lives difficult. Use Protect on Fencing Master and your face. You will now be left with an Eye of Winter, a Fencing Master and a Shelterwing Rider. You can now Protect the Rider to refresh that Aegis, stun the Spirit of Resistance with Eye of Winter to pump up the Fencing Master and clear the way for a lethal attack. If you have an aegis on an entomb unit it will be protected from Steward of the Past’s ability. Attack with your two units (dealing 1) play the Ticking Grenadin, use Protect on it, then cast Harsh Rule and the entomb will do the rest of the work! Did you know that aegis will block multiple effects that happen simultaneously? Use Eilyn’s Favor, activate Stormcaller’s ability to hit your opponent’s face, then cast Lightning Storm to clear the board. Your Champion of Fury can now attack, though you need to Protect him from a Lightning Strike. Really easy puzzle. A + space then Execute something. Doesn’t matter what, since you just need to deal 2 damage. Just as you come in a Snowcrush Animist comes down. You can undo his stun effect with both silence and endurance. Make sure you use Shield on the 5/1, then silence your Owl, and attack with everything. A 4/4 is going to be blocked, but you get 10 across anyway. Stun all your opponents units (Rebuke the Titan then Flash Freeze the other units). Now unstun your Rilgon with Accelerated Evolution’s endurance mode and attack for 6. Rolant really messes things up since most of your spells don’t work. To remove him us Ruin, then Polymorph and Violent Gust. Now the Riders are vulnerable. Use Rockslide to ping off the aegis on both, then Scare one to death, chill the second, then attack for lethal. This is certainly a tougher puzzle. You actually just need to get the Gemblade from the Fencing Master into your void so you can put it on your Valkyrie. Attack for 2, then play Fencing Master, use Permafrost on the 6/6, then use Accelerated Evolution’s endurance mode on the Cyclops. This will unstun it so you can block with the 5/5 Fencing Master. You can now redraw the Gemblade with Reforge, play it on the flyer, then buff it an addition +1/+1 with Accelerated Evolution, and attack for 14. Attack with everything then Rapid Shot your Valkyrie when it is blocked. This will stop the opponent’s 6/6 lifesteal from dealing damage, so they gain no life, and you deal 3 for the victory! 20 damage is a lot in one turn, but double-double damage (aka Canadian damage) is a powerful tool! Play Tinker buffing either your Brigand or Twinbarrel, then play the Brigand and give it the Twinbarrel. You can now Torch the Paladin and Strength of Many the Brigand to deal a clean 20. This is more about overwhelm then it is about double damage. Attack with everything. The 5/4 will block the 4/4 Stranger. Now give him Rampage and Teleport the blocker. All his damage will be dealt to the opponent because he has overwhelm. It is important to do things in this order, since teleporting first will send the 4/4 out of combat, even though it seems like it should functionally work the same. We need to gain some life while setting up our alpha strike, because that Instigator is looking to take us out. Give a Helm to either your Familiar or your Excavator, and then use your Ring on the other. Then play your Shogun of the Wastes, and A + Space. You will be able to survive combat because of your lifesteal unit. Now you can end the game through one final damage, which you can get from a snowball or an Instigator ping after using Combust. Calderan Gunsmith deals 2 damage for your double damage units! Trigger Spark with Forgewolf, play Groundbreaker to stop life gain, play Twinbarrel to give your 7/7 double damage, then play Gunsmith. When the shoot-out ends, your opponent will be left at exactly 10, which is enough to attack with the 7/7 overwhelm double damage and win. Since your opponent can’t gain life, the puzzle is solved! To save your Ranger you can play your Storm Lynx, dealing 2 to the opponent. On your turn you can Unlock some potential, and then beat some face to deal the final 6. This is more of a lifeforce puzzle. Play Ayan to stop the Carnasaur attack. This gives your units +1/+1. Now on your turn you can attack and the lifegain trigger from the Oasis Seeker will pump your units to both 5 attack units, dealing a perfect 10. Oddly, this puzzle almost solves itself. Play the Lynx to divert the killer attack. Your opponent will attack you, but that doesn’t matter. On your turn you can play the Arcanum Monitor to pump your team and draw 2 cards from Wisp. This gives enough stats to end the game. This one is especially tricky because you don’t know what is in your opponent’s hand, but the most important card is Gun Down. This means that if you play Dune Phantom to block and use Refresh to save it, it will be Gunned Down. Instead, Refresh yourself (going to 1), play Dune Phantom end of turn, than use Victor’s Cry on your turn to deal the needed 5 points of damage. Obviously you don’t block the 2/2 with your 1/1. On your turn you silence the 6/5 with Valkyrie, which buffs up the Hero so you can do exact lethal damage. You have a whole whack of removal spells to cast, you just need to figure out where to aim them. Temper the 1/1, Purify the 4/3, then used Bring Down to Silence the 5/3, so you can suffocate the 3/3 that remains. Now the way is clear to beat down for 5! You have a lot of cards in your hand, but most of them don’t matter to the situation. What you really need to do is remove the Tormentor such that it is neither available to be player, nor is it able to generate a Spiteling from the void. The 7/7 dragon will just eat itself on the opponent’s turn, so it doesn’t really matter if there is no friend to pair it with. Bounce Tormentor with Displacer, Use Vara’s Choice to discard it, then attack for 5. The AI won’t do anything, so you can attack for next turn and end the game. This game has clearly progressed in a very unusual fashion, and we are playing a very unusual deck. You cannot play the Dawnwalker because you do not have TT (and you won’t find a second time from the top of your deck). Use Herald’s Song to discard both Spirit of Resistance and Dawnwalker. Now play Ayan and use his ability to summon the Spirit (this works because Ayan’s ability silences the unit you summon). The Slasher will become a 4/3 because of the Dawnwalker being summoned with Shepard’s Horn out. Now you can attack for 8! This game looks easy enough when we get in, but our opponent has a trick up their digital sleeve! They have a Righteous Fury that we need to play around, though that is pretty easy. Use Silence on the 1/1, and attack with both units. The opponent will block with both on the 4/4 and then cast Righteous Fury (on the Magus) in a bid to survive. After the Righteous Fury Resolves and before damage you need to use Bring Down on the Magus to reverse the spell. You will now hit for 5 in the air, and 1 on the ground, dealing the needed 6 to end the game. Play the Revolver to deal 2 to the opponent’s face, and then kill the 5/2, then play the Daisho and kill the opponent with your second attack. Here we learn about how Stonescar Maul gives all your spells overwhelm. Equip Maul, then use Gun Down on the Soul Collector, then Violent Gust the Wasp, and finally attack down the Reaper. This will leave you at 1, your opponent at 6 and your Fevered Scout at 6/6 for perfect lethal. Ordering here is important, so don’t get sloppy. Auric Runehammer protects you from all damage, not just from damage you take while attacking. Play it, then Torch the Reaper. You can now hit down the 4/4, use Spiked Helm on you 4/4 and attack for 10. Here you need to get a buff on your Maul, but the sequence is somewhat strange. Play it, then play Talon of Nostrix to ditch the Maul, then Reforge it back and play it again. You need to play the Armorsmith to survive the hit from the Dragon, but that should be exactly 8 damage (1 going to the face). Another puzzle involving ditching weapons! Play Talon then play Excavate to put the Sceptre on top of your deck. Now play Artisan with the Warhelm and attack. This gives your Sceptre +2/+2 while dealing 3. You can now play the Crowd Favorite to grab the Sceptre, which will be at exactly 5/5 to finish off the game. Drawing Echo copies of Static Bolt will give you double the bonus! Play the Nesting Aviasaur and put the Bolt on top. Now play the Trailblazer to give it Echo. Attack with the Explorer, and you will get two 0-cost 4 damage Static Bolts, which will cleanly finish off the game. To clear the Cultist you need to play Cliffside Porter and then Combust the 2/4 away. You can now Dark Return the 0/1 back to get two 1/2s, which have charge because of the Jito. You can now play them both and deal the needed 3 points of damage. Remember: whenever you have the chance to draw cards in these puzzles, you should count on you deck for nothing but Sigils, so hoping to draw into something clever is a trap. In this case, that is almost a blessing! Play Voice of the Speaker, then cast Herald’s Song, discarding the Privilege of Rank, then play a power and cast the Seek Power. Ultimately this will draw you just enough cards to finish the game. You need to get some charging dinos operational to take down this puzzle. Play Tinker Apprentice targeting a Hatchling, then play Accelerate on the same card. Now play Nesting Aviasaur and tuck the 3/2 Hatchling back on top. Inspire will draw you into the Hatchlings, which have now grown to 4/3. Attack with both to deal the needed 8. Ah, this takes me back. There was a time that “this” was a deck and anyone who played it probably figured out what was happening as soon as they saw the cards, but some players might be flummoxed. You can actually deal as much damage in this puzzle as you want since there is a really sweet loop you can assemble. Play Trail Stories x 2 on Second Sight. Now cast it to put it into the void. Play Excavate to put Second Sight back on top. Now Play Trailblazer to give it Echo. Levitate one of your units to draw into Second Sight. Now cast one of the copies of Second Sight and put a power back on top (NOT the Second Sight). Now use your second Excavate to your echo Second Sight on top, and cast your other copy. You can now cast Second Sight from your hand and put one back on top. Do that again. And again. And again… until your Scout is big enough to kill in one hit! Play Predator’s Instinct on the Phoenix and attack down a blocker. You can now replay it because of the entomb and attack down the second blocker, clearing the way for you 6/6. Game! This is another of the “win in two turns” puzzles. Attack for 2, get your snowball and play your 7/7. Your opponent will play a Humbug on their turn. Sacrifice the 2/2 at the start of your turn, Snowball down the 1/1, then Haunting Scream the 2/2 to attack for 9. The Snowball you draw from the infiltrate will finish the job. Play the Pyroknight and ultimate it. Now sacrifice it with Combust to kill the 0/7. Replay it with the Guide, ultimate it again, play Jack’s Knife and attack with your 12/11, and your 1/1. Once blocks and lifesteal are counted up you have exact lethal. You obviously need to alpha strike here, but play the Xenan Cultist first! It will be important. Attack, and then play Shepards Horn, followed by Guide. Since you hit with 2 units, Sanguar is now considered a 0 cost unit, so you can resummons him with Guide. Since he is a 6/4 from Cultist, he also brings back the Dawnwalker, which triggers the Horn. Now play Cultist Aspirant and the Xenan Fanatic. The Fanatic will brain the opponent for exactly 10 when you pass the turn, so you are safe! This is a pretty weird line you need to take, involving killing a lot of your own stuff. Play Makto, then combust the 4/6 with Makto. Now Torch your own dragon. Cast Tinker then cast Rise to the Challenge. Makto is now a 7/7 with Flying, Charge, and Destiny so the extra +2/+0 is enough to be close out the game when you attack with him. You need to piece together what combination of influence actually maximizes damage. If you play the Hooru and the Praxis Stranger they will each add an effective 2 damage between pumping up the Forsworn Stranger and the Flash Fire in hand. Play’m both, attack for 4, and then burn face for the last 5. Play the Finest Hour on the Order to start off with. Next, play out your Combrei Emissary and both your Seek Power. Now play both your power, to get the Order from 4/4 to 16/16. You can now play the Elder’s Feather to top things off for the full 17. You pretty obviously need to block and use Righteous Fury to Survive, but your instinct to block the 3/3s is misguided. Being invulnerable to damage means that lifesteal doesn’t work! Block a 1/1, use Righteous Fury, play Morningstar on your turn, and attack for lethal. Unlike previous puzzles, your deck is actually full of cards that are not just Sigils, so unfortunately you can just do like 50 damage with the District Infantry but you only need to do 8, so no big deal. Play a power and Vodakhan, and then attack with both of your units. On the Whispering Wind trigger you need to discard the Privilege of Rank, and the Vodakhan wil put them into play because of destiny, and the Infantry will grow to 7/7. As a reminder, you cannot use cards like Xenan Initiation or Dragonbreath on False Prince. Well, you can, but you won’t like the outcome. You can remove the blocker by casting Syncronized Strike followed by Dragonbreath on the Araktodon, then jam for 6 with the Prince. Now you cast Bad News to refresh both your units, and finish the puzzle. You’ve got a lot of options here, but not a lot of power. You need to attack with everything, and then use Annihilate on your own unit that is blocked by the Infernal Tyrant. This stops lifesteal from working, so the 5 damage you deal will be enough to end the game. This is a puzzle chiefly revolving around influence requirements. You also have a few turns to win, since you start at 25 life, and your opponent only has Flamestoker for pressure. Play your two Seals first, each for Time influence, then play your Praxis Stranger. You can also play the Sand Warrior now too! On turn 3 attack with both units, play your Banner and cast Accelerate on your Champion. On turn 4 you should play the Champion and attack. You may be thinking that blocking is a better strategy, but your opponent actually has a Rally in hand to blow you out. On your next turn you should be able to kill the AI. We have just enough power to cast everything in our hand, but we will need to sequence everything properly get maximum damage. Attack for 8 with the Dawnwalkers, then play the 2 faction fixing Strangers, Grinva, and Seek power for a Time Sigil (which you should play). Now play Alpine Tracker to kill the 2 Dawnwalkers to deal an additional 8 with Grinva. Now your Forsworn Stranger should be a 5/5, so play that to bring back the Dawnwalkers. Now play Kalis to sacrifice your own board and deal a ton of damage with Grinva. This should deal put your opponent at 14, which is magically the exact same as the size of your Kalis. The card second from the top is a Firebomb that you need to avoid, while to top card is a spiked helm that you can use to finish the puzzle. Drawing the Firebomb will obviously kill you. Play Second Sight, and put the Firebomb back on top. Now play Trailblaze, using it to tuck the Firebomb on the bottom of your deck. Play the Sigil you draw, to then Seek Power for an additional +1/+1, and play the Spiked Helm to finish the job. It is awful difficult to get a Sandstorm Titan airborne, but you can try! Ping him with the Stormcaller, give him flying with the Acolyte, then kill him with the Violent Gust. You will now be free to deal 8 with your flyers without any obstacle. Discount Titans are needed to solve this puzzle. Use Trail Stories on the Call of the Titans, then cast it. Now play Sauropod Wrangler, followed by the Press-Gang. You will pull a 6/6 for 1 out of your deck, which you can then play and attack with because of your Jito. That will be enough to deal the needed 7. Two blockers that you need to clear here, but that is easy enough! Play the Duelist to stun one, and then use Detain + Scare to kill the other. You should then be clear to finish things off. You obviously need to play the Magus to get some pressure on the board, but the 3/3 will just die to your opponent’s killer units. Play the Magus, but then Polymorph the Magus. You opponent will just play a power and pass the turn. Now load up the Dragon with the Saddle and attack. You opponent will block with only one 3/3, but now you can blow them out with Talon Dive, dealing lethal damage. This is another puzzle where the cards in the deck should be expected to be totally irrelevant, and there is nothing you will draw into with the devour to crack the puzzle open. Decay the Sword of the Sky King, then play the Spore Folk, copy it, devour it, and then Dark Return it the replay it. That should flip over most of your deck, but you will need to play the Excavate (on anything), play a power, and attack to finally clear out your deck to finish the game. Ah, it is nice to end on The Witching Hour, one of my favorite cards in the game. Play Talir’s Choice for two explorers, then attack with West Wind Herald to cast that again. That will give you just enough health to play Hall of Lost Kings for 5 units. Now play Grenadin Drone, and Sacrifice your board with Kalis (which will be a 24/24). Now play Torrent of Spiders, then Dark Return on your Grenadin Drone and replay it. This will reduce the cost of The Witching Hour just enough so that you can play it. Use the killer Horseman to clear the 4/4 block, and then bash your opponent for lethal.